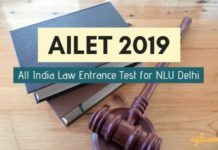 The National Law University, Delhi conducts All India Law Entrance Test (AILET) to fill up 80 seats in BA LLB, 35+5 seats in LLM, and 05 seats in PhD courses. 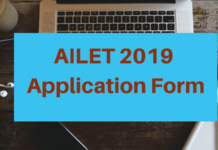 Check more details regarding AILET exam such as eligibility criteria, important dates, exam pattern, syllabus, how to prepare, etc on this page. The selection of candidate is on the basis of their performance in AILET. Foreign nationals are exempted from giving AILET. A total of 10 setas in the institute will be filled directly with the Foreign Nationals on the basis of merit in qualifying exam. 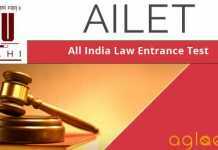 Check here AILET Exam Date in the table below. Eligibility for B.A., LL.B. (Hons.) – Candidates should have cleared their 12th with minimum 50% marks. Candidates who are awaiting results for their last qualifying exams can also apply for the exam. Eligibility for LL.M. – Applicant should have completed their LL.B. course from a recognized university with a minimum aggregate of 55% marks and 50% in case of reserved categories. Eligibility Ph. D. – The candidates must possess LL.M / Equivalent degree with 55% marks. 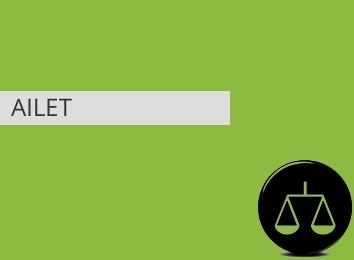 For BA LLB course – The exam will be of 1 hour & 30 minutes duration. The test will be total 150 MCQ questions. There will be a negative marking of 0.25 marks for every incorrect answer. For LLM course – The exam will be of 90 minutes duration. The exam will consist of 100 MCQ questions and 01 essay question. It will be of total 150 marks. There will be negative marking of 0.25 marks for every incorrect answer. Essay One Essay of 50 marks on a topic of law from the above subjects. For PhD programme – There are 100 multiple choice Objective Type Questions of one mark each which has to be answered in the OMR Sheet. There will be negative marking of 0.25 marks for every incorrect answer. The syllabus will be different for all the courses. For LL.M. programme, questions will be asked from Law of Contracts, Criminal Law, Law of Torts, Constitutional Law and Legal Theory. To prepare well for the examination, the candidates can refer to the below-given preparation tips. Read newspapers daily to catch up with GK and current affairs. It is advised that you give at least 7-8 hours each day to prepare for law entrance exams. Out of the 90 minutes in the exam, you should give around 20 minutes to the English section. 10 minutes each can be for Mathematics and GK. 25 minutes each will be required to attempt the Legal and Reasoning sections. Solve as much as AILET previous year question papers. It will not only help you in your revision but will also help you analyze your performance. Here are some of the highly recommended books by the toppers for preparation for AILET exam. More than 12,000 students appear for the AILET UG every year against only around 80 seats. The candidates can check the previous year cutoff to get an idea about the minimum qualifying marks. 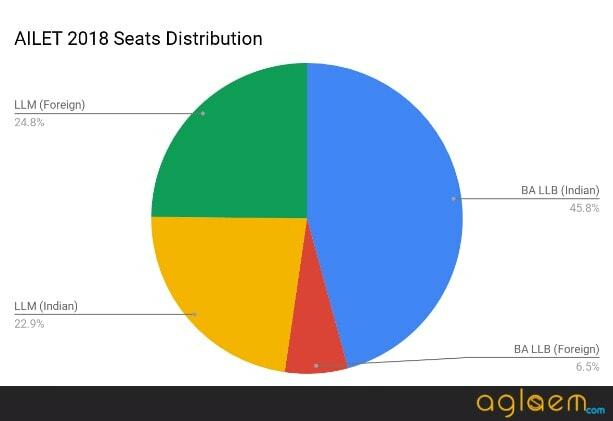 Note: One additional seat for Kashmiri migrants, and two supernumerary seats for the residents of Jammu and Kashmir. However, for LLM course the criteria for the additional and supernumerary seat is not applicable. Electricity Charges Rs. 12,000 p.a. Library Fee Rs. 3,000/- p.a. Internet Fee Rs. 8,000/- p.a. Sports and Games facilities fee Rs. 3,000/- p.a. Room Rent Rs. 18,000/- p.a.